The HP Envy is aptly named. One glance and you'll be coveting it. Its brushed-aluminum exterior and elegant curves make it one of the sleekest -- and slickest -- convertible Ultrabooks now on the market. Its feature set and preloaded software aim it squarely at consumers, but if performance isn't paramount, there's little reason it can't be used in a small-office fleet as well. Like the Acer Iconia, the Envy X2 is a dockable convertible, with its keyboard also serving as the dock. When attached, the keyboard provides extra battery life, full-sized USB and HDMI ports, an audio jack, and a full-sized SD card slot. Apart from the keyboard/dock, the tablet offers audio, front and back cameras, an independent charging port (it's the same style charging port as on the keyboard), and a microSD card slot. It's a little hard to pop cards out of the last slot without a tool, but it's a handy way to add storage to the Envy without a factory upgrade. The whole unit is only 3.1 pounds when docked (1.5 pounds undocked), and the magnetically guided docking latch itself is quite sturdy. When the unit clicks into position, you can literally feel it. Dual speakers on the bottom of the tablet, powered by Beats Audio, provide good sound even when the unit's docked. One detail you're not likely to complain about with the Envy is battery life. Both the main unit and the keyboard have separate batteries, which together gives 10 or more hours of use by HP's estimates. (HP claims up to 19 hours depending on the workload.) I got a whopping 11 hours, 15 minutes in my Netflix rundown test when using both batteries. Furthermore, the Envy uses battery power intelligently. Power is drained first from the dock, then the main unit, so the main unit remains as fresh as possible when undocked. As an Atom-powered system, it doesn't get very hot, so there are neither vents nor fans. On the other hand, as an Atom-powered system, it isn't suited for more than casual office work. How well does the dock work as a keyboard? Pretty well, despite the lack of backlighting for the keys, a feature I've come to appreciate whenever it appears in notebooks. I had little trouble typing comfortably for extended periods of time, and the touchpad is generously sized, with a double-tap-to-disable hot corner in the upper left. Unfortunately, it's a little too sensitive to edge swipes, so I kept accidentally flicking between applications when trying to do other things. Worse, the touchpad control software doesn't let you adjust the sensitivity of edge swipes -- I ended up disabling that feature entirely. The Envy X2 is a consumer-oriented machine. There's no management-oriented hardware: no TPM, card module, or fingerprint reader, for example. I braced for the usual gamut of preloaded consumer-oriented software, such as the HP-branded photo and music apps, and the CyberLink YouCam app. Fortunately, most of those items come in the form of Windows 8 apps that don't clutter up the desktop. The only branded apps included are links to the eBay and Snapfish sites, as well as HP's own support and recovery manager app. Truly usable as either a laptop or a tablet, the Envy X2 may be the most smartly designed hybrid I've tested. The hardware is solid, the battery life is long, and the price is right. If you crave versatility and portability, but don't require desktop-class performance, the Envy could be just ticket. Height: 11.93 inches. Width: 8.12 inches. Depth: 0.76 inches. 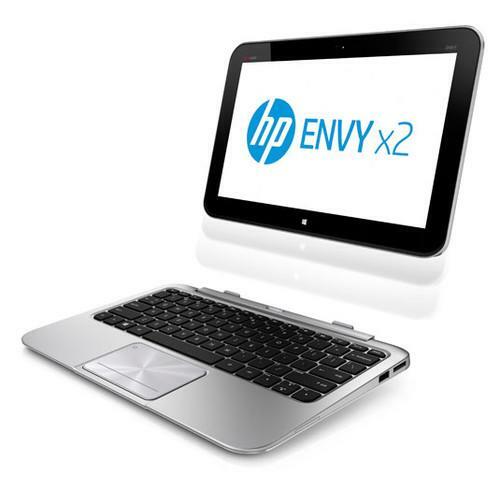 This article, "HP Envy X2 review: A Windows 8 tablet to covet," was originally published at InfoWorld.com.